There was a moment five years ago when it seemed the UK might end up without any domestic train manufacturing company. The Bombardier plant in Derby, the sole survivor, had just suffered a near mortal blow when the contract for new Thameslink trains was given to the German company Siemens, with no requirement to manufacture anything in the UK. The decision over such a big contract, which encompassed 1,140 coaches, caused a furore, with both unions and politicians in uproar, as they expressed concern that the move threatened the very future of train manufacturing in Britain. They were right. Bombardier was finishing a couple of orders and had a large London Underground in the offing but the threat of closure was very real. The UK would have been left without a train manufacturing industry. The threat of closure was partly the result of the lumpiness of investment under privatisation. There was no BR to coordinate the purchase of rolling stock and consequently the highs and troughs which had always bugged the industry had been made worse. It was also, though, because we damn British play by the rules when it comes to fairness and competition. While the French and Germans – and indeed the Spanish and especially the Japanese – make damn sure that any orders for new trains go to their domestic companies, British governments have an ideological attachment to the free market which means we don’t favour our home industry in the same way. Competitive tenders are, genuinely, well, competitive. However, the fuss over Thameslink scared the politicians sufficiently to ensure that Bombardier got the equally big Crossrail order and it has won several others to ensure there is a fairly – but by no means entirely – full order book until 2019 or so. Three out of five of its lines are operating suggesting there is still some spare capacity. Visiting the factory on Valentine’s Day made me realise both how close we had come to a national industrial disaster, and how important it is for the UK to retain this capacity. The factory is much changed since my last visit a few years ago when it was in a trough. There were, for a start, lots of different trains around. The oddly name LO-train – that is LO as in London Overground – for the West Anglia routes recently taken over by Transport for London are in full production and outside there was a couple of completed Electrostars in an old fashioned and very attractive dark green livery for Great Western’s newly electrified suburban services. 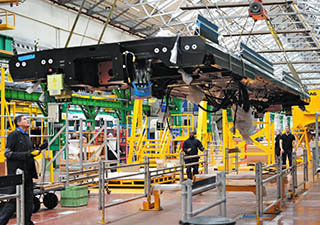 Old Southern trains were being refurbished in mid life while Aventra trains – Bombardier’s new range of electric trains – were being built for Anglia. And of course, bits of Crossrail trains were being assembled throughout the factory and in the huge new 250 metre long V shop, where finished trains are stored and displayed, there was a complete set which was about to head south to the temporary depot in Ilford. It was not just busier than during my last visit. There were other changes, too. First, it was noticeable that there was a much greater emphasis on health and safety. I was given steel toe capped boots to walk around in and a reinforced baseball cap – much cooler than a ghastly yellow hardhat but just as effective as saving one’s bonce from being damaged by collapsing panels, apparently the most common hazard. Matt Colclough, the site general manager who was showing me round, said that there had previously been three or four head injuries a year, and now there had not been any for ages. The whole place was far cleaner than I had remembered it, with far fewer trip hazards. Computers were everywhere, and every action carried out on a train was logged, to ensure that progress was constantly monitored. It was too, much quieter but that may be as a result of new technology rather than health and safety. The second difference, a much more important one, is that there is so much more going on. The company does more itself than it used to, rather than simply outsourcing and assembling. Many more parts of the trains are designed and made in Derby, rather than simply outsourced. Various sections of panelling, for example, are made in situ and the wiring is all put together while they are hung on huge panels which is a far easier way of working than trying to fix connections inside the carriages. The company has taken back some of the processes back in-house to create a more reliable supply chain: ‘It is all about how quickly we can take stuff from the drawing board to the market’, says Des McKeon, the Commercial Director,’ Relying on external suppliers can slow the whole process down’. However, taking on this work and skilling up the workforce requires a constant flow of work which, at the moment, Bombardier has got. Many other important components are sourced in Derby such as the big steel frames for cabs, or elsewhere in the UK, such as large aluminium panels which are produced by a company in Somerset. Other parts come from within Bombardier’s huge empire, with the bogeys, for example, being manufactured in Germany. Amazingly, really big extruded panels are no longer made in the UK and have to be sourced from China or Germany, the only two countries with the capability of producing them. The philosophy has changed, too. put it neatly, as McKeon puts it: ‘In the old days, it was acceptable to build a train and shove it on the network. You can’t do that any more.’ So why do we not export our trains? McKeon has an interesting take to a question he has been asked often: ‘You need to be very secure in your domestic market first. Without that you can’t export. ’ Although relations with the Department for Transport which, he says, ‘is a lot more clear and transparent in its dealings with the market than it used to be’ have improved since the dog days of the Thameslink order, ‘we do not expect any favours from them’, McKeon emphasises. McKeon is also anxious to revive the DMU market, for pretty much the same reason. Bombardier currently no longer makes any and the current shortage of non-electric trains may endure given the unexpected complexity and cost of electrification. There certainly would seem to be a potential market there. There are two threats to this vital part of British industry. The most obvious is simply orders running out. Bombardier have lost a few and the company is most unhappy about Merseyrail’s decision to go for the relatively small Swiss firm, Stadler, over which it is even considering going to court. While refusing to talk about it for legal reasons, it is thought that Bombardier were angered by the evaluation between the two manufacturers, particularly over the aspect of ‘deliverability’ since the company has spare capacity that would easily have accommodated the order. It is indeed surprising that the city region combined authority, which ordered the Merseyrail trains and are all Labour authorities, did not consider that placing an order for trains built in the UK would be a boost for domestic employment. The other threat is that the government, which ultimately determines the nature of train procurement even though train operators have more of a say than they used to, will place too much emphasis on cheapness. That might mean that while Bombardier could still win contracts, but many more components might have to come from China, negating many of the advantages of keeping the industry in the UK However, Theresa May’s stated interest in an industrial strategy, the first time such a concept has been mentioned in decades, may be good news for Bombardier which seems a perfect fit given its emphasis on regional development and supporting existing industries. the contrast between the Hitachi plant where the IEP trains are being assembled and the Bombardier factory could not be greater. Of course in these days of a globalised supply chain, no single factory builds anything as complex as a train or indeed a car or a tractor, but there is a very big difference between what is happening at Newton Aycliffe which I visited just before Xmas, and Derby. Just to give one example – in Derby there was a room housing four hundred engineers, with a few industrial designers thrown in, working on their computers to design the next train or improve existing ones. At Hitachi, all those people are employed in Japan. Of course Newton Aycliffe has created several hundred jobs, but it is, whatever its PR people tried to impress upon me, an assembly plant with a far higher proportion of its output sourced abroad. Moreover, its future is far more uncertain once the ridiculously overpriced IEP order is completed. My readers will know that I can be critical at times of commercial outfits whose words do not match up to their actions but I was genuinely impressed with Bombardier. The firm may be Canadian and it may enjoy certain advantages from its monopoly status as the last domestic train manufacturing company, but the work it is doing is vital for Britain’s future. There are all too few Bombardiers remaining, and too many towns where Brexit seems to local people the answer to their area’s industrial decay. Derby should not become another one. With some 1,700 jobs in the factory, and around ten times that number in the supply chain in the UK, the Department for Transport and other arms of government must ensure it continues to thrive.